Aren't these wise words? 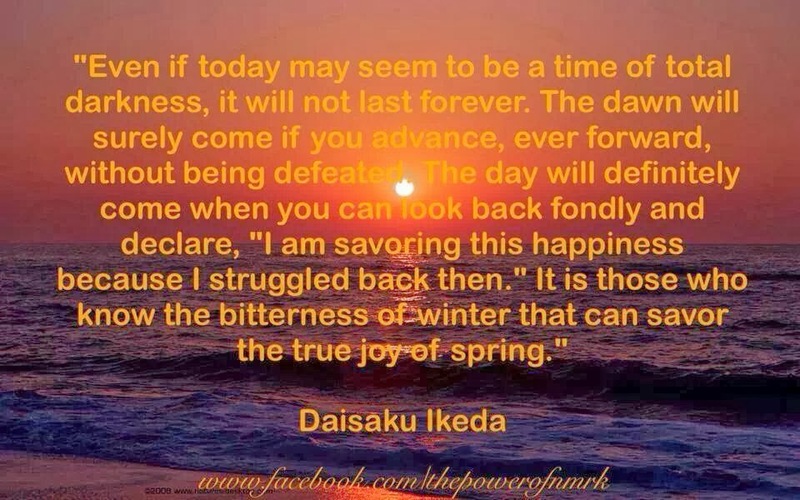 Aren't all of Daisaku Ikeda's words full of wisdom, practical wisdom for our lives? Entering the New Year I feel such gratitude to be able to chant Nam-myoho-renge-kyo along with my mentor, Daisaku Ikeda, and along with all of you, my friends all over the world. I have been hearing from so many of you...all my courageous friends. 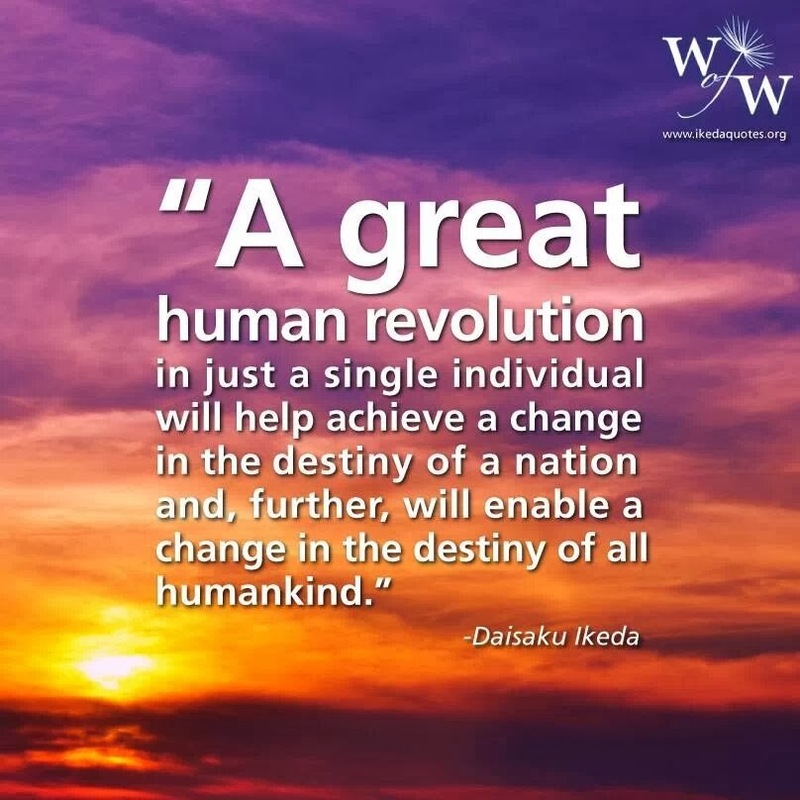 We do our Human Revolution by making our great vow for kosen-rufu. What does this mean for each of us? Here is my interpretation. As always these are my views only. I speak to you from my experience and don't officially represent the Soka Gakkai. 1. I vow to use my life for Kosen Rufu. I vow to use every thought, every action, every word and every prayer to transform my life, to discard the transient and reveal the true, and to change the world through tapping into the power my life inherently possesses through chanting Nam-myoho-renge-kyo, studying Buddhism, doing shakubuku and deepening my connection with my mentor-in-life Daisaku Ikeda. 3. 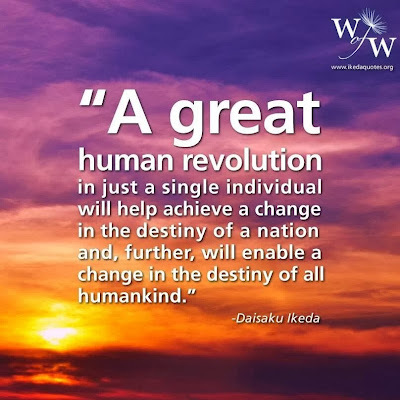 I vow to win in all areas of my life, health, love, happiness, friendships, family, (both my real family and my Gakkai family) work, writings and wealth for the sake of Kosen Rufu. This year is 2014. The 4 is very significant. To me it symbolizes stability. Security. Foundation....like the four legs of a solid table. This year I am determined to learn money management, build a solid foundation for myself and lead a life where I can travel freely to visit my friends all over the world. You! I have always been protected financially throughout my practice of chanting Nam-myoho-renge-kyo twice a day every day for the last 28 years. I have never longed for anything or gone into any kind of debt. Even this year, when I decided to take the time to write my book I was never without anything I needed or wanted. I was always protected. But I want more. Right now I am visiting my Dad and Stepmom Janis in beautiful Asheville North Carolina and learning from them. I am chanting to deepen my understanding of the financial world. This will be a real leap for me! And I tie it to my vow of Kosen-Rufu. If I can accomplish my goals, so can anyone. I enter this year with a new job (I start on the 6th) and a new relationship. I'll tell more about this after we've had more time together, but right now it looks and feels so warm and wonderful. If I can chant to change my life from the inside out, and have all these results, so can you. Write me at chantforhappiness@gmail.com. Share your victories! My name is Gurjeet from Maryland. I received my Gohonzon on New Yea's day . I have already seen a change in my life.. all positive. I always enjoy reading your blog. Thank you for sharing :-). NMRK. wonderful... every day we have to be victorious. nam myoho renge kyo.